Building a scale model of Boston's South Station & the history of the railroads who called it home for the last 112 years. My first 2 Fast Tracks #8 switches! Monday, April 25th. Marks the day that I started actual work on the physical model of the South Station Layout. What you are looking at here is the first 2 #8 Switches I have built for the layout. #1 is on the left while #2 is on the right. I built these switches using the Fast Tracks #8 switch building jig. The first switch took me 2.5 hours to build; mostly due to the fact that I kept referencing the instructions & videos on how to build switches. The 2nd switch took me 1.5 hours to build. Not bad for someone who has never built a hand-laid switch in their life. Fast Tracks takes the mystery out of building switches, crossovers, etc. 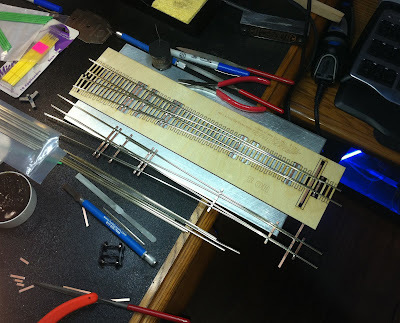 by providing a jig cut out of Aluminum that allows you to not worry about keeping everything in-place while soldering & making sure the track is in-gauge. As long as you follow the instructions, it is nearly impossible to screw up the process. Using the first switch as a test bed for construction techniques, I honed my skills on perfecting soldering techniques as well as how to properly file, cut, & shape the rail. Yes, before you ask, I made quite a few mistakes; in fact I had to de-solder 2 rails because I forgot to file the rail web off the bottom of the first one , or in the second instance - tried to re-bend the rail after I soldered it in-place with disastrous results. I used this golden opportunity to learn how to correct mistakes during construction. Although I did, in the end make the switch work properly, I doubt I will ever use it in on the layout due to the fact that the soldering is, shall we say, less than spec - in fact it is downright dreadful. The second switch, however is a keeper. It turned out quite well and operates smoothly. Since I perfected my soldering, it looks much cleaner. This is one of the beauties of Fast Tracks - If you totally screw it up, you can simply try again. All you've invested is the rail (which can be cut-up and reused) and the PC Board ties. Fortunately for me, when I bought this kit, I did remember to purchase extra PC board ties & stock rail because I knew I was going to need them at some point. The only task remaining is cutting the gaps into the rails so that we can electrically isolate the rails. Now I'm sure some of you are asking why I am going through the trouble of building my own switches when I can simply buy them off the shelf ? One reason was the fact that the Trackage for South Station is not stock-off-the-shelf AT ALL. Since the station yard was built in a relatively small area, the switches & double-slips are very close together. For the most part - one switch transitions directly into the next one. To build this would require me to take off-the-shelf switches and heavily modify them. I figured that since I need to do this, I might as well hand-build them so I can modify them during construction. The other, more important reason is cost. The average cost for a #8 switch is about $30.00. I need to build around 25 of these. That would cost me $750.00 if I were to buy them. Mind you, I still have to modify them to make them fit on the layout. The Fast Tracks kit cost me $262.00 (including shipping) which yields 5 finished switches. To make more , each one will cost me around $14.00 to make. In the end, this comes out to around 50% cheaper than if I had to buy them. Factor in that I have to modify the switches, even with labor, it still comes in much cheaper. Finally, These switches look simply beautiful when completed. They look like a real switch that has been hand-laid from scratch. My next task is to build one of the 5ea 14 degree crossovers I need on the layout. I had to buy this jig because of the fact that although I only need 5 of them, no one commercially makes a 14 degree crossover. These crossovers will come out to costing me $48.00 each. - Expensive yes, but I cannot build the main crossing diamond without them. One note about Fast Tracks - The company is out of Canada (eh?) so if you opt for the free shipping, It is going to take a long time for your package to arrive. My 14 Degree Crossover took 21 days to arrive from the time it left Fast Tracks to my house. If you choose the 3 day shipping, you will get your stuff in 3 days. I've since chosen to pay the 3 day rate simply because it took only 3 days plus the fact that the package is insured against loss if it never appears on your doorstep. I will be posting a separate update to show you the completed 14 degree crossover. Right now, I have the infamous #8 Double-slip Switch on-order as-we-speak. Why infamous you ask ? Well, suffice to say, it is a very complex & tough switch to build. I need to build 34 of them. I created this site in order to document the Construction & Operation of South Station Terminal, Boston Massachusetts in both 1:1 & HO Scale (1:87th) Scale. We will also discuss the history of the railroads who called South Station their home since 1898.